These Special Edition Bee Brand Bumble Bee Playing Cards feature a mirror bumble bee image on the card backs. Made from Bee Playing Card stock for superior snap, slide, and shuffle, Bumble Bee Playing Cards are casino-grade. 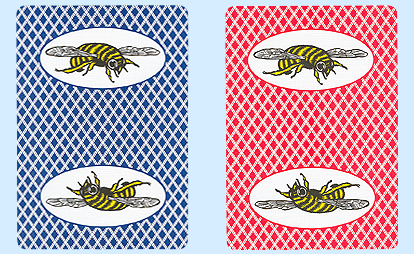 Bumble Bee Playing Cards are poker/wide size with regular index numbers. The decks come half red and half blue. For additional information or wholesale pricing on Bumble Bee Poker Playing Cards, please contact us at 1-800-233-0828.